Americana Pip Berry Garland with Stars - 48 inch by D.I.D. at Two Clock. MPN: unknown. Hurry! Limited time offer. Offer valid only while supplies last. This beautiful Americana Pip Berry Garland with Stars is approximately 48 inches long tip to tip and will look wonderful in your home or office. 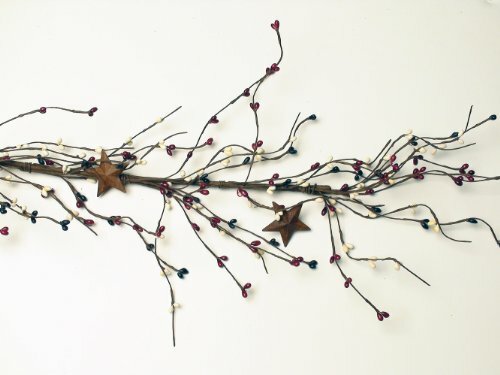 This beautiful Americana Pip Berry Garland with Stars is approximately 48 inches long tip to tip and will look wonderful in your home or office. Made of bendable wire, it can be shaped to fit into almost any location. Displays beautifully for July 4th, too! By industry standards, all pip berry garland measurements include approximately 6 inches of stem on one end for linking garlands for a seamless look or for curling so that the garlands may be hung. This stem may be hidden by arranging the pip berries closest to it.